The silent spring morning of my mid-century suburban childhood were broken by the sounds not of birds chirping but of a symphony of puttering gas lawn mowers synchronized all over the neighborhood. 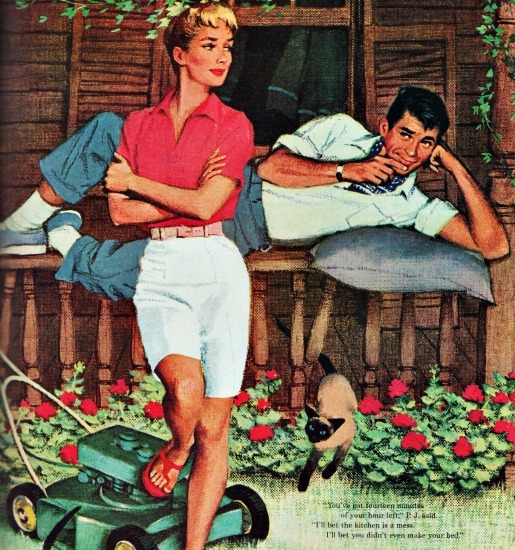 While ladies might putter in the garden, the lawn was strictly male turf. 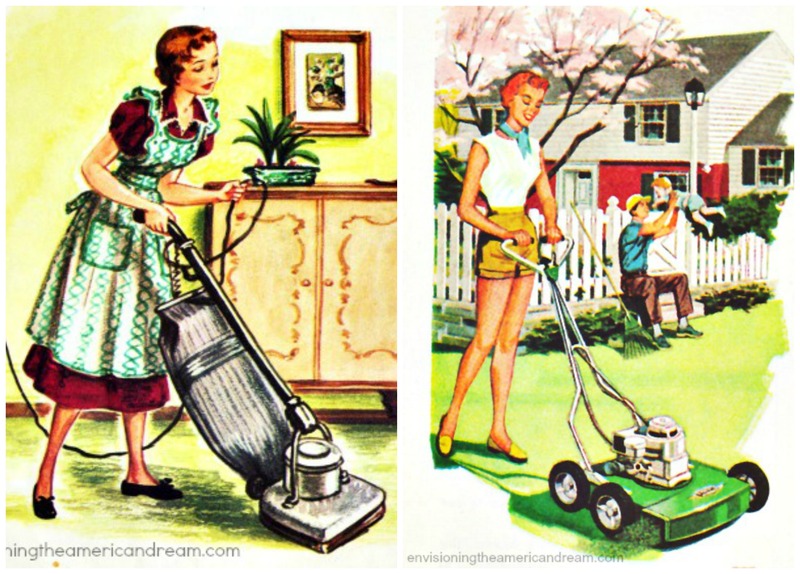 But there was one fearless housewife in our neighborhood who broke the grass ceiling, venturing boldly and brazenly into that vast male prerogative known as mowing the front lawn. Most afternoons the Kaffee Klatch of new young mothers from our new development would congregate in one anothers fully loaded Kelvinator kitchen. These recently built ranch houses were part of a bumper crop of housing that were sprouting up with record speed, and now stood in the fields where only a year before Farmer Gutsky planted Long Island potatoes. The newly minted suburbanites would gather exchanging hints on such vital information as which was the best diaper service, the most reliable milkman, which Jackson Perkins roses were the best to plant in the rocky Long Island soil and how to keep hubby off the links and onto their front lawns with their power mowers. One neighbor who regularly was absent from the Kaffee Klatch was Martha Mc Guinness, the neighborhood’s reigning do- do-it-yourselfer Queen. As much as my mom raced about like a whirling dervish, she was no match for Martha who more often than not missed out on the Kaffee Klatches for some do it yourself project like installing some new asbestos Kentile floor covering in the baby’s room. All the girls marveled at Martha. A freckled face 22-year-old mother of three she didn’t let pregnancy or a household of toddlers get in her way. After all, there’s so much to do to get ready for that little bundle of joy. Even with a “bun in the oven” Martha was a real force of nature. 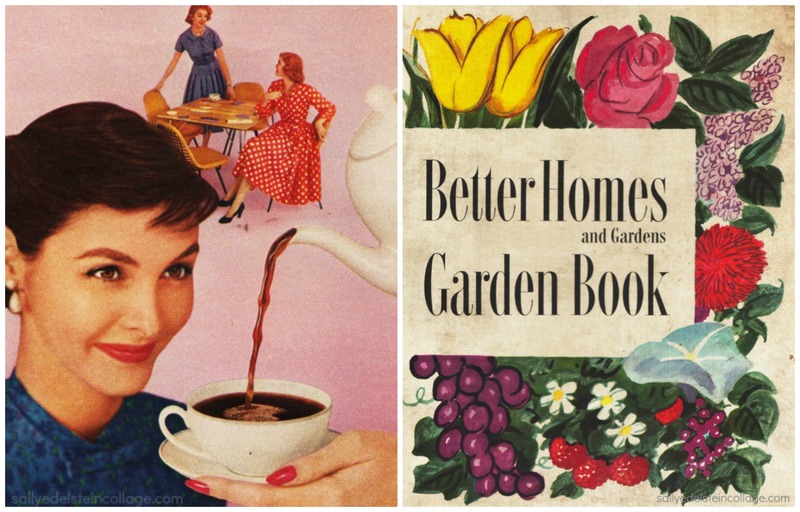 If she wasn’t busy chemically stripping and painting an heirloom crib in it-never-flakes-lead paint, she’s off gardening making sure to spray plenty of insecticides to get rid of those pesky old flies, grateful for the new insecticide bomb that contained both DDT and Pyrethrum! She was also the only gal in the neighborhood who could be found every Saturday morning marching up and down the lawn with her Lawn Boy, leaving in its wake a lawn as smooth as velvet. 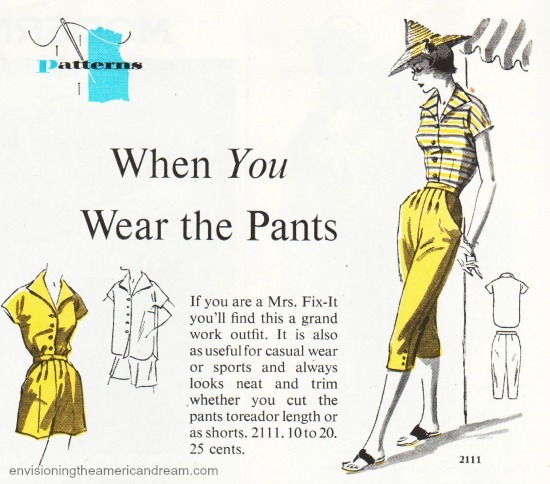 While advertisements for power motors often showed scantily clad young women in short shorts and dresses to attract the attention of the male reader, Martha chose sensible poplin peddle pushers, foregoing the pumps for a pair of good ol’ Keds. 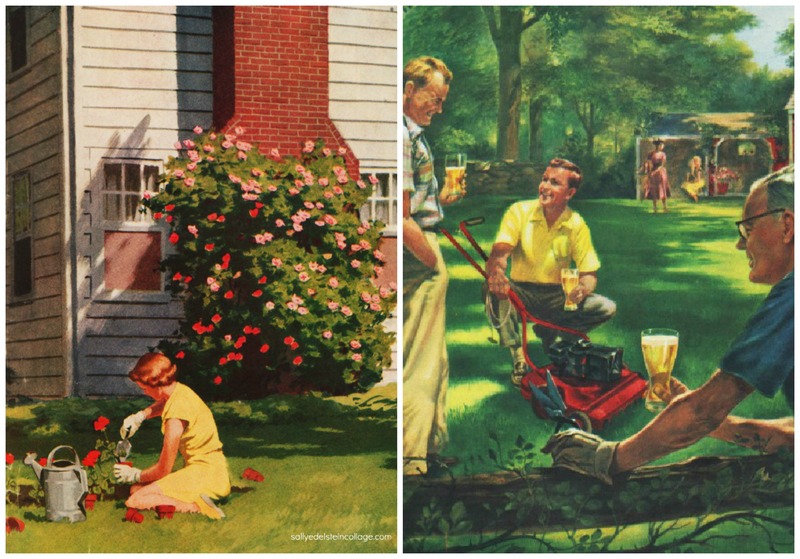 Of course like all homeowners, the gals were concerned about the appearance of a perfect lawn, the very symbol of the American Dream and suburban success. Women’s magazines were chock full of “Advise to the Ladies” articles on achieving the exemplary deep green lawn. But they did not assume women did the work themselves. Women who wanted model lawns got men to work on them. A smart cookie could cleverly manipulate her husband to achieve a beautifully landscaped home, guiding them for example, into buying proper lawn food or fertilizer. 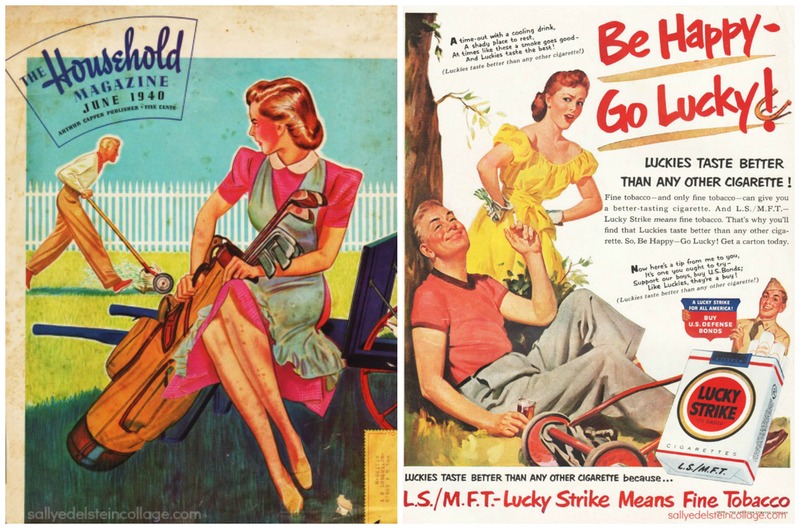 Some ads acknowledged that in the modern marriage, wives were often part of the decision-making process for the purchase of power equipment even though men were actually the ones to use the mowers. Look Lady We Designed This Big Mower Just for You! 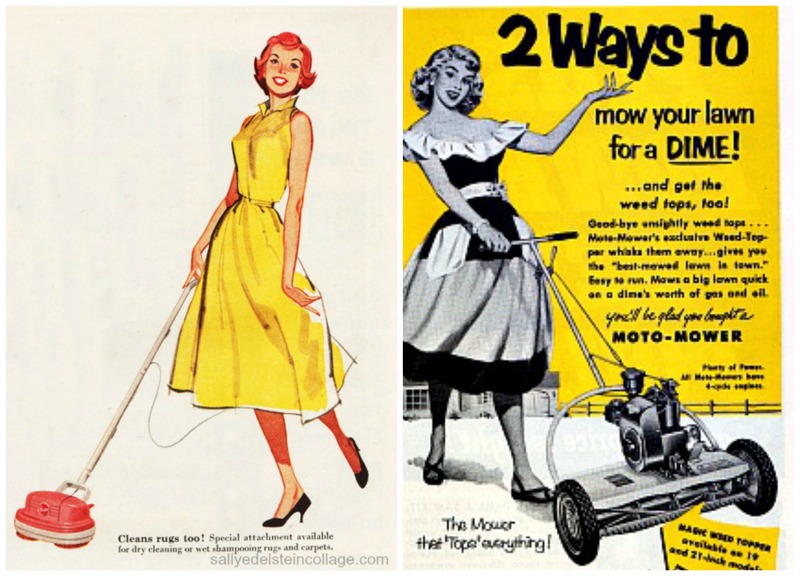 As the suburbs continued booming, clever ad men began to see the opportunity to include women in an expanding lawn care market. 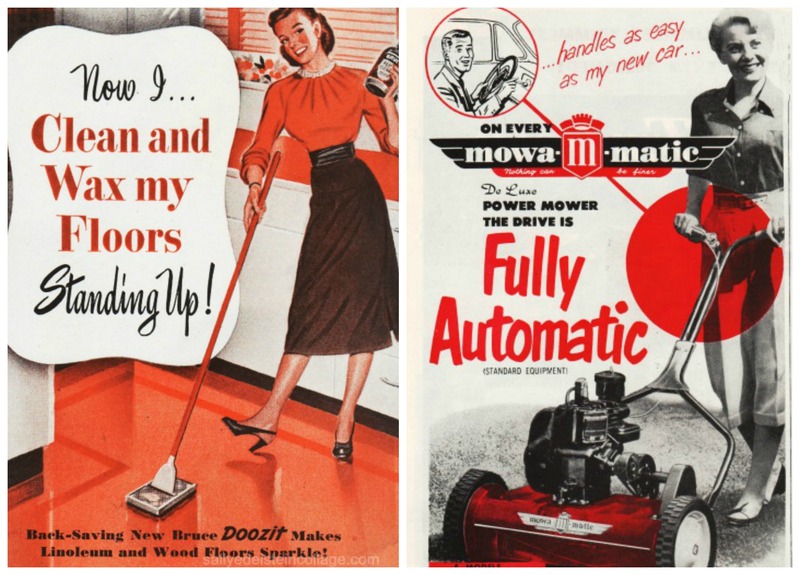 Advertisements for power mowers began appealing to women by making it sound as easy as housework. Lawn mowing could be downright fun. 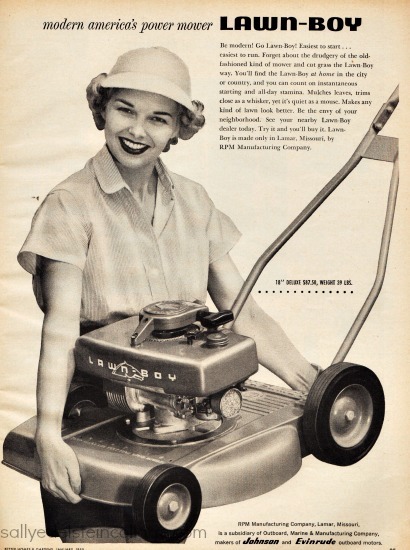 “Lovely Conover Girl Joan Tuby” coyly appealed to the ladies that choosing a lawn mower was “Like picking a Husband.” Wearing short shorts and a halter top, the vivacious model also appealed to the gents. Despite the best efforts of ad men, men dug their heels into their turf and lawn mowing remained a male domain, then as now. 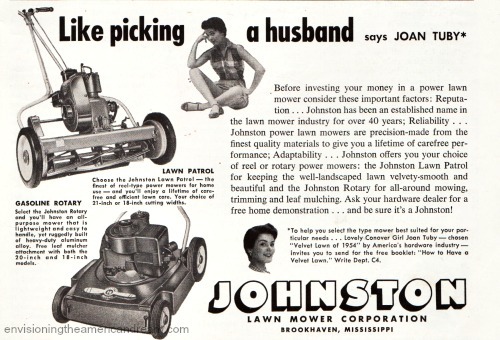 The people who wrote this do not know me: “Easier mowing makes husbands easier to get along with!” And this is definitely not true: Lawn mowing could be downright fun. Martha McGuinness sounds like a dream come true. Evidently all these folks did not have a lawn that has a mind of its own. I do. One of the things I do miss about those times is the kids in the neighborhood, myself included, had the freedom of the outdoors. Saturday morning I was out of my house by 8. My mother didn’t see me till 6 that evening. There was a great big world out there to explore. The kids today have lost so much when they can’t have that experience. Though I wish social change could move much much faster, nevertheless it is still wonderful to see America’s social behaviors slowly mature and grow out of some — although not all… yet — of its puritan-prudish, or patriarchal, or antiquated norms. Great post Sally! Positive change and awareness at any speed is always welcome. When I was still working, mowing the lawn meant coming off a hot day at the job to a dirty, hot, dusty chore of mowing the lawn. I hated it! Then I decided to get a push mower. Lower maintenance for the machine. Less noise. No fumes. Cut the grass instead of beating it down. AND, best of all, I could do it in the cool of the morning (5 AM!) before work, BAREFOOT! Woo hoo! I came to love mowing the grass, and my neighbors marveled that it always look nice though they never saw when I tended to it. Oddly enough, I think pushing that hand mower actually was easier than pushing the power mower, too, though that might be a mistaken notion based on my joy at being free of the nastiness of machinery that made a horrible racket, stunk of oil and gasoline, and definitely was dangerous in comparison. A neighbor backed their power mower over her toes and amputated a couple toes once, an event that was the talk of the neighborhood for a summer. Between gas powered leaf blowers, hedge trimmers, lawn mowers etc. the suburbs are now a very noisy gas guzzling place. Kudos for you for using a hand mower! Another marvelous post. At first, I thought the mower ads featuring women were intended to show men how easy the power mower made it — even a woman can start it! even a woman can lift it! But you made your case — I love the ad showing the man playing with his baby while the wife mows the lawn. 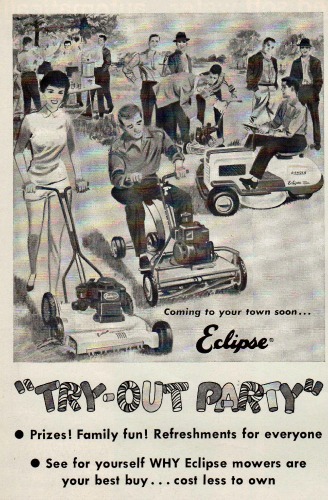 However, another ad shows a woman pushing a power mower, while a man is on the riding mower — and these mechanical toys for boys are still the case, as far as I can tell. Glad you enjoyed it. Yes the ad with man playing with the baby as his quite comely wife (who clearly has her figure back after having a baby ) mows the lawn, is a nice twist on gender roles. Reblogged this on My personal bread.